15 Years ago today, Dandy decided to tell the world about his personal circumstances. Greetings from the home of your (almost) daily columnist......... Now that things have started to get back in to a routine as both of the 2-foots now go out to work, I thought that I might give you a tour of where we live. We have a massive 2 story condo that is in the hallway of the house where our pet 2-foots live. We like it in the hallway as it is cooler during the day than most of the rest of the house, and no-one can come and go without us knowing all about it. Whenever our 2-foots are at home, we allow them to open the doors of our condo, and then we hop around some of their house. We don't really go anywhere except for the lounge and the hall, because the kitchen has a slippery floor, and neither of us can be bothered hopping upstairs. Occasionally, one of us will be taken upstairs. Every so often, one of the 2-foots will stay in bed late, and the other one will carry me upstairs (well it saves climbing), and let me hop all over the one that's still asleep so that I can wake them up. 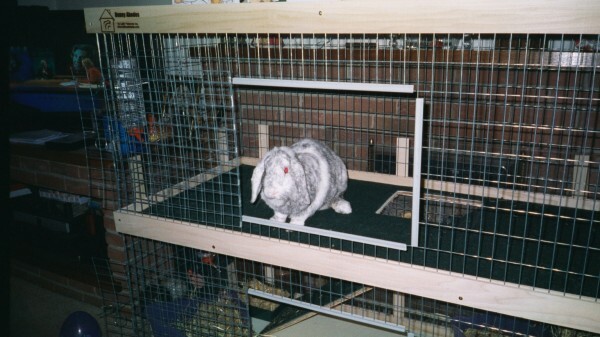 I always hop back downstairs on my own, although I am very careful as it's a long way down. The other reason we might be taken upstairs is for a botty bath. I have only ever needed one, but Flopsy girl occasionally needs them when she can't be bothered to clean herself properly (she had one last night). Outside of the 2-foots house, there are 2 gardens. One at the front, and one at the back. We don't really go in the front one very often as it's not very safe. There is no wall or fence around it, and we could wander off and get lost, or be bunnapped! The back garden is very nice (except for the useless pond), and on sunny days, we love to play in it. Beyond the garden, there is a HUGE place called Wetherby that is a 2-foot settlement. It must be the biggest place in the world, I mean it is absolutely massive. My 2-foot can walk very quickly, but I've heard him say that it takes him over 20 minutes to walk from one end of it right to the other! So my friends that is where Flopsy Girl and Dandy Bun live. Why don't you let me know what it is like where you are? Gosh, right where we live. We live in a place called Tiptree. Our 2-foots say it's a place that seems to be growing daily ... we're not really sure what that means. Well, we have our very own bedroom which is also quite handy is the office, hence why I am able to get time to play with the computer. We also have two indoor hutches, which is where the food, water, hay and litter tray are kept, but at the moment one is occupied during the day with Tigger. I have heard though that our 2-foot may let him stay out all the time very soon. In the evenings our 2-foot lets us run around the upstairs. She always seems to block the stairs off though ... doesn't she trust us? But I understand what you mean; it is a long way down so Loppy has informed me. We do go into the garden on very nice days, but I feel the cooler days are nearing so I do not think we will be going out for a very long time. That's it really, a quick tour of our home. Take care and bye for now - Thumper-Binx, Mister Jingles, Loppy and Tigger. PS - I think I'm in for a bottybath tomorrow, arrrh!